1. Put the couscous in a bowl; season. Bring the stock (or water) to the boil, pour over the couscous and cover the bowl with a plate; set aside. Heat the oil in a large sauté pan over a medium heat; add the courgette and a pinch of salt. Cook, stirring, for 5 minutes. Meanwhile, blanch the beans in boiling water for 2 minutes; drain. 2. Add the beans, garlic and chilli flakes to the courgette and cook for another 3-5 minutes, stirring, until it is all just turning golden. Fluff up the couscous with a fork, add the lemon zest and most of the parsley; combine. 3. Add the prawns to the pan, stirring until warmed through, then check the seasoning and add the lemon juice. 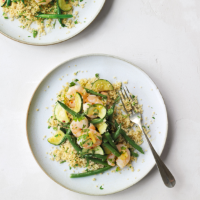 Divide the couscous between 2 plates, then top with the prawns, vegetables and cooking juices. Sprinkle with the remaining parsley to serve. Wholewheat couscous is higher in fibre than the regular kind. It also has a slightly firmer texture and nuttier flavour.